Heisig’s Remembering the Kanji proved to be a great start for me for learning the kanji. The idea of making stories for each character is a genius way to break down otherwise complicated compounds into memorable entities. But there was one big hole in Heisig’s book. After 500 or so characters he drops the bomb when he leaves you to make your own stories alone. In my case, I found it difficult to make my own kanji stories. Perhaps I was lacking creativity, I thought as I continued to struggle. Unfulfilled New Year’s Resolutions came and went and I cursed Heisig for not finishing his book. Other long-term Japan expats have told me they had similarly frustrating experiences with Heisig’s book. 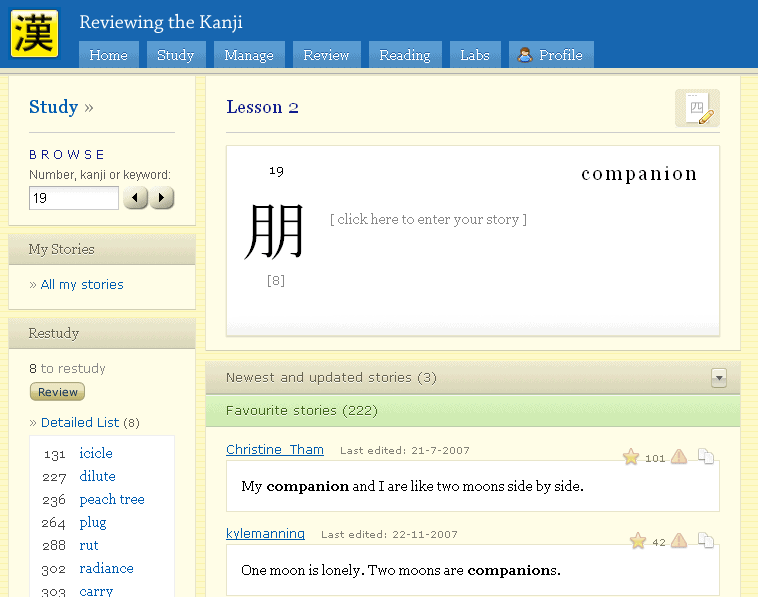 Happily though, I found a great free online resource, Reviewing the Kanji. The Reviewing the Kanji site has kanji stories for Heisig’s book made by and voted upon by users. You can add the characters as you work your way through the book and schedule reviews. It’s a nicely designed site and easy to use. This is a great addition to the book. Suddenly, you have countless stories for each character at your disposal. The combination of the site and Heisig’s book allowed me to vastly improve my knowledge of the kanji and their radicals. The readings had to be learned separately by wide reading (hint, hint PeraPera 🙂 ) but I’m of the opinion that being familiar with the characters and their radicals is useful and these resources certainly helped me along the way. Hope those starting out or wanting to refresh their kanji knowledge found this useful. So how did you learn the kanji? Any advice for our readers? We’d love to see other advice people have! I absolutely love the perapera-kun add-on. I was wondering if it would be possible to get the Japanese names dictionary working again. In recent versions of perapera-kun/Firefox I cannot seem to get the names dictionary installed. It would be an invaluable addition to your application.